The 3-Zone Timing Drill is one of my all-time favorite passing and timing drills! I’ve been using the 3-Zone Timing Drill for years as both a player and a coach. I love it because it simulates passing patterns that happen over and over in game situations––particularly in breakouts and regroups. 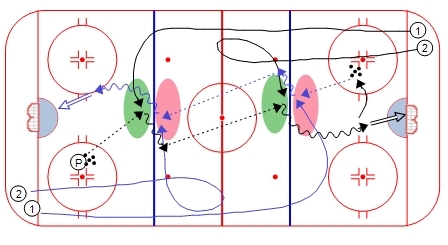 This is a “classic” flow drill with lots of passing, timing, and shooting. Make sure you check out the One-Touch Timing Drill as a precursor to this drill. 4. Receiver takes a shot, picks up a puck from the circle, and hits the first player of the other line in the first red receiving zone.